Mothers and Daughters of all ages are invited to join us for this free event. Choose to either host a table or to sit with your friend. 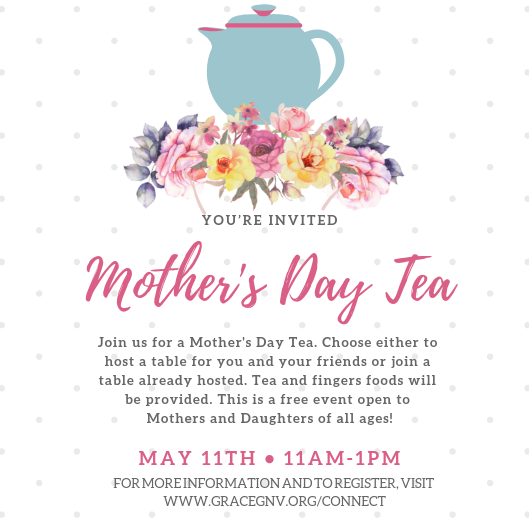 Tea and fingers foods will be provided, and if you want to bring your favorite finger foods to share, please indicate it on the sign up. We will follow the public school schedule for holidays and breaks. Comfortable play clothes. No dresses please as we will be stretching and want even the little ones to remain modest and covered. We will dance barefoot. Hair must be pulled back in a pony tail, braid or bun. Dancers are asked to wear bike shorts or leggins with a t-shirt. Worship Dance t-shirts will be available for purchase but are not required. We will dance barefoot. Please bring socks to each class for practicing turns. Pre-K will need pink footless tights. All other dancers will need pink footless tights and a longsleeved white leotard. We will try to recycle as many white leotards as possible so you may want to wait to purchase if you do not have a leotard that currently fits. We will have a short devotional each week and may include scriptrue memorization as well. Classes will incorporate technique, strength training and choreography. Dances will be presented during church services throughout the year. The purpose of Partners in Ministry (PIM) is to go beyond traditional “church membership”. We want to demonstrate what it is like to partner together as fully involved, disciple-making followers of Christ. In the context of a small, interactive group, we will learn, pray, and worship together. We will help each other discover the unique gifts, passions and abilities that God has equipped us with and how to best utilize our gifts in His service. Partners in Ministry will conclude with a time of commitment and vows. Childcare is available. If you’ve lost a spouse, child, family member, or friend, you’ve probably found there are not many people who understand the deep hurt you feel. It may be hard for you to feel optimistic about the future right now. This can be a confusing time when you feel isolated and have many questions about things you’ve never faced before. But there is a place to find help, hope, and encouragement. Grace Church and Sira Gainesville offer a Grief and Loss class as a part of Wednesdays at Grace. The next session will begin Wednesday, January 30th. Do you struggle with patterns of debt and poor money management? Would you like to learn practical and applicable skills that lead to financial success? FIT Financial Success teaches individuals and families how to manage and increase personal finances alongside Biblical truth and responsibility. Offered by Grace Church and Sira Gainesville as a part of Wednesdays at Grace. The next session of FIT Financial Success will begin January 30th.